Every felony drug case that makes it to court in Delaware County passes over the desk of one man, Delaware County Drug Prosecutor Brian Walter. The position of drug prosecutor was created seven years ago when the Delaware County Prosecutor’s Office received a grant to fund the position. Prosecutor Carol O’Brien said her office was excited for the grant because staff members knew the position would become an integral part of the prosecutor’s office. O’Brien said having one prosecutor focus on only drug cases allows them to become experts in that field. Walter said the laws regarding drugs keep changing and being focused solely on drug-related issues allows him to keep up with it. Walter said he handles every felony drug case from start to finish and presents his cases to a Delaware County Grand Jury every four or five weeks. These cases include everything from traffic stops all the way up to major drug trafficking rings. O’Brien added that because Walter handles every drug case in the county, he has a good rapport with local law enforcement. “I have a relationship with law enforcement and am a point person they can call about a case or changes in law,” Walter said. According to Walter, there is a misconception that people are being sent to prison just for possessing drugs. He said a sentence in a drug case depends on certain factors. Walter said there’s a two-pronged approach when handling drug cases, noting that a drug trafficker will usually be sentenced to prison time, whereas prosecutors pursue treatment for addicts, depending on their record and other factors. “It’s good to see someone clean and on the right path after overcoming stumbles,” Walter said. Walter said the most rewarding cases are those that end with someone getting treatment for an addiction and getting clean. O’Brien said the grant for the drug prosecutor position ended several years ago, but the office made the position part of its budget to deal with the increase in drugs and drug-related crimes in Delaware County. 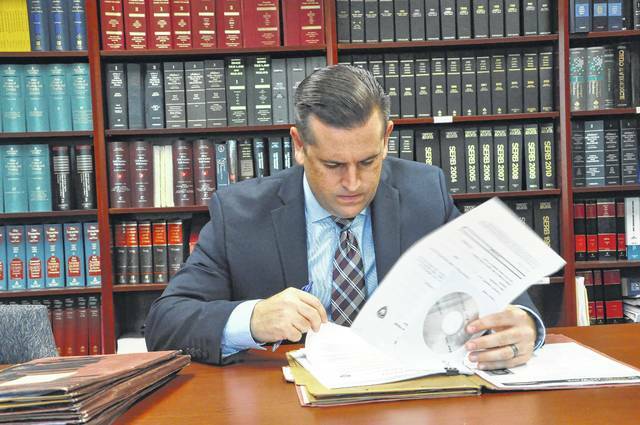 Delaware County Drug Prosecutor Brian Walter reviews a case file in the Delaware County Prosecutor’s Office. Walter said he has to remain current on Ohio’s drug statutes, which are constantly evolving.